Store servers, network and telecommunications equipment securely in this 42U solid steel rack. The RK4242BK 42U 42in Server Rack Cabinet features an all steel, welded frame construction that provides durable, high quality rack storage at an affordable price. This modular 42U cabinet helps save space in the server room by using an innovative split rear door, and is designed to suit any server room footprint design, while housing any standard 19in rackmount equipment. Plus, adjustable front and rear rails allow you to shift mounting depths to suit almost any piece of rackmount equipment. To help optimize ventilation, the cabinet offers steel mesh doors with wide perforation, and includes an integrated cable management system that helps keep the inside of the cabinet neat. 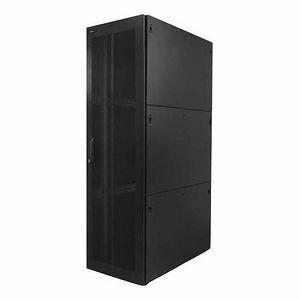 Plus, the rack rail spacing is clearly marked, making it easy to plan and install equipment within the cabinet.This high quality 42U Server Rack Cabinet is backed by StarTech.com's Lifetime Warranty.